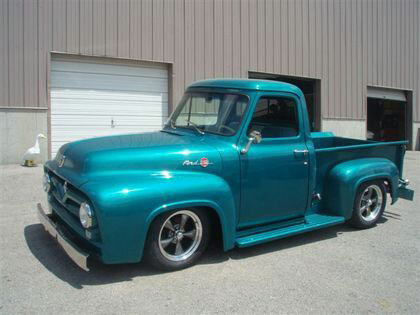 Out of Kentucky comes this really nice resto-mod style 55 Ford F100. A combination of modern amenities and old school 55 hot rod make this one really nice daily driver. This ’55 F-100 has a fresh Metallic Teal base coat/clear coat exterior that has never seen rain. Tan interior, carpet * headliner with teal trim & bench seat piping make for a beautifully unique color combination. New tinted glass & seals all around. New chrome Ididit tilt steering column is topped by a tan leather banjo steering wheel. Dynamat throughout the cab & doors keep things quiet in the cab. Power steering & power front disc brakes make this a comfortable driver. Powerplant is a stock 302 HO Ford V-8 engine with a Holley 4 bbl carb fed by a Lokar gas pedal & linkage. Factory headers connected to a new 2 1/2″ exhaust system give it just the right rumble. 235/60R17 directional tires on new REV Torq Thrust style wheels. Suspension up front is Volare disc brake/torsion bar conversion. The stance is adjustable by way of the torsion bars. Right now it has the ‘just low enough to look cool but not worry about scraping the pavement look. In the rear are new leaf springs & shocks. New wiring. New battery with cutoff switch. The bed is stained oak & sealed with stainless fasteners.